Marlon Byrd's 12-year Major League career hasn't exactly been the stuff of storybooks. Until now. 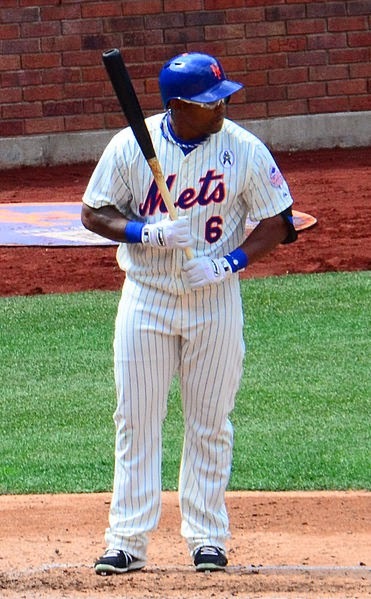 Byrd made the Pittsburgh Pirates better when they picked him up from the New York Mets in late August. More to the point, the Pirates have given Byrd a chance to win, finally. This isn't Marlon Byrd right now, but it is a more typical rendering of Byrd's career, as he is wearing the uniform of a poor team (slgckgc/Creative Commons Attribution 2.0 Generic license). In 12 Major League seasons, Marlon Byrd has played for a lot of teams that became good after he left, but not until August has he ever been on a team that was good with him on it. The Pittsburgh Pirates picked up Byrd and John Buck on Aug. 27, shipping two minor leaguers to the New York Mets. It has proved to be the most astute player move made by any team during the season. Correlatively, the Cincinnati Reds made the worst in-season front office blunder, failing to make a waiver claim on Byrd when they could have done so and freeing the Mets to make a deal with the Pirates. Byrd produced three homers and 17 RBI with an .843 OPS during the last month of the season in Pittsburgh, adding a little pop to a Pirates team that really needed it. Byrd also homered and drove in two runs as the Pirates beat Cincinnati, 6-2, in the wildcard game, underscoring how badly the Reds botched his availability. In the first three games of Pittsburgh's National League Division Series with the St. Louis Cardinals, Byrd has three RBI, including a two-run single in the first inning Sunday, when the Pirates captured Game 3, 5-3, in front of PNC's raucous crowd in the Steel City. Byrd is not unusual among his new teammates in that he was down and out, a guy no one wanted. He's 35, and he was part of the Boston Red Sox disaster last year, serving a 50-game suspension for performance enhancing drug (PED) use. He signed a minor-league deal with the New York Mets this spring, earning $700,000 at the major league level. He is a huge part of the Pirates magic right now, along with outcasts like Francisco Liriano, Russell Martin and A.J. Burnett. Byrd came up with the Philadelphia Phillies in 2002 and finished fourth in the 2003 Rookie of the Year vote after producing a .784 OPS. In 2005, the Phillies moved him to the Washington Nationals for Endy Chavez. Byrd signed with the Texas Rangers as a free agent in 2006 and lasted there through 2009. The Phillies became winners fairly soon after Byrd left, the Nationals became competitive fairly soon after he left, and the Rangers became winners immediately after he left. The 2013 season has been his best. Byrd batted .291 with 24 homers, 88 RBI and an .847 OPS. His .511 slugging percentage was fifth in the National League. Back in 1999, while he was in college, Byrd picked up such a serious infection in his right leg that doctors wanted to amputate it, but he picked rehabilitation, instead, and fought his way to the major leagues. In 2011, he was hit by five pitches in 10 days, including a blow near his left eye that weakened his facial bones and required him to wear a protective mask. After the 2011 season, Byrd began practicing Muay Thai and lost 40 pounds. In April 2012, the Chicago Cubs traded him to Boston. Less than two months later, he tested positive for Tamoxifen, which is legitimately used to treat breast cancer because it prevents the growth of breast tissue. For steroid users, it stops the body from crashing after cycles. Here is the statement Byrd issued after he was suspended for 50 games: "I made an inexcusable mistake. Several years ago, I had surgery for a condition that was private and unrelated to baseball. Last winter, I suffered a recurrence of that condition and I was provided with a medication that resulted in my positive test. Although that medication is on the banned list, I absolutely did not use it for performance-enhancement reasons. I am mortified by my carelessness and I apologize to everyone who loves this game as I do. I will serve my suspension, continue to work hard and hope that I am given an opportunity to help a club win later this season." That's his story. The man has been through a bit. Finally, he's getting something for it. Finally, he is getting a chance to win, and he is all over it.